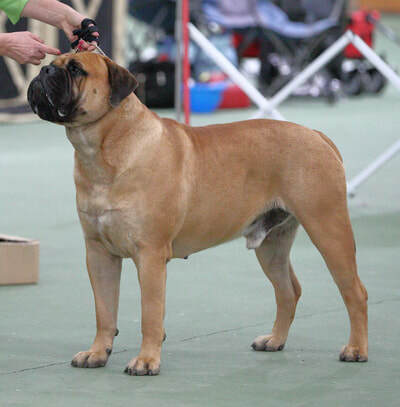 Lovers of the bullmastiff breed. Our family live on our small farm just north of Auckland city, NZ. Here we all, including the bullmastiffs, enjoy the wide open spaces. Our bullmastiffs are very well socialised with children and the community, as temperament is extremely important to us. Our team have achieved the same results at Specialty Open Shows and have also achieved All Breed Championship In Show and Group awards. We only breed occasionally as we keep at least one pup from every litter. All our parents are hip and elbow scored before breeding. You may be wondering why are we called Bodacious ?? Bodacious means Remarkable, Audacious, Impressive and Attractive. All information and photos found on these pages are owned by Bodacious Bullmastiffs. Unauthorised coping is prohibited. Demi produces 3 stunning girls on 15th October 2018. Buzz (Supreme Aust CH Nightquest Magic Affair), the sire, resides in Melbourne. Bodacious Out On Bail "HANK"
​NINA (Daisyfield Offspring from Kugel) gains her NZ Championship Title in style winning Best Junior of Group at both Wairoa Kennel Assn shows (April 2018). PETAL (​Bodacious Shake It Petal) wins BEST ON PARADE at the Bay Of Islands Ribbon Parade at 10 months. Also Hank (Bodacious Out On Bail) wins Puppy on Parade at 7 months. ​​Many thanks to Judge Paul Goodwill for thinking so highly of our babies. On the 6th August 2017 Happy naturally whelped 9 puppies (4 boys and 5 girls) and was instantly a very devoted mother. They are all lovely pups with outstanding pigment, good bone, great square heads and first and foremost, are strong healthy babies. ​We look forward to watching these guys develop and already know the task ahead of us to choose our keeper will be extremely difficult. We are so proud to announce the birth of Petal. Dam: Bodacious Twisted Angel and Sire: CH Bullestate Charles Bronson. We are so delighted with our baby who was born on the 15th May 2017 and are excited about watching her develop. March 2017: Axel gains his NZ title at 15 months and limited showing. Along the way he also won Puppy of Group, Junior of Group and Reserve of Group. He is maturing nicely, has strong movement and a fantastic easy going personality. 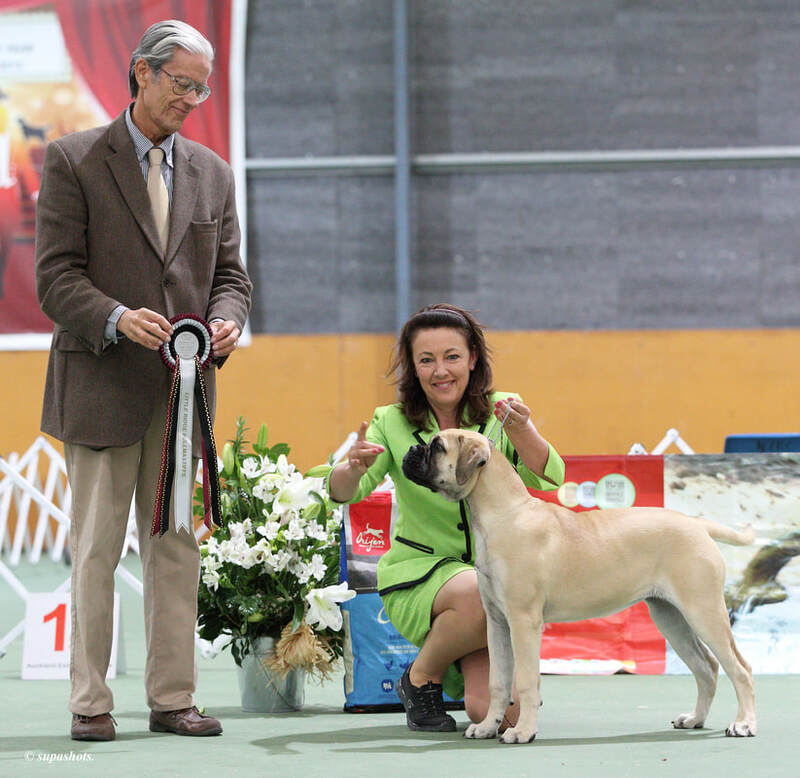 September 2016: Dual BISS Dual RBISS CH Kugel Tomorrows Dream wins BEST in SHOW at the annual NZ Dominion Bullmastiff Specialty under breed specialist ​Mr Rafael Malo Alcrudo (Spain) at 7 years and 8 months. Wow!! what an achievement!! ​I met Nina for the first time after the Bullmastiff Specialty 2016. She immediately took my eye with her feminine correct English bullmastiff type and her self confidence . 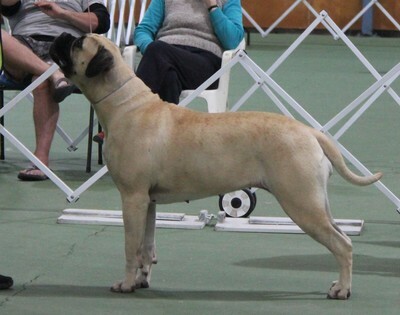 ​Her genetics are full of very special bullmastiffs including her grandfather "Koda" who I imported from Australia. ​I look forward to watching this young girl mature. ​Axel and Nina will be being shown at a select number of shows in the North Island of NewZealand. Please feel free to contact me if you'd like to know when and where we will be as we would love you to meet the team. If you happen to see us out and about please come over for a chat. We love to share information about our dogs and the bullmastiff breed but more importantly the dogs love attention and would love a cuddle.